Fee: £279 per day. Max. 32 children per class. 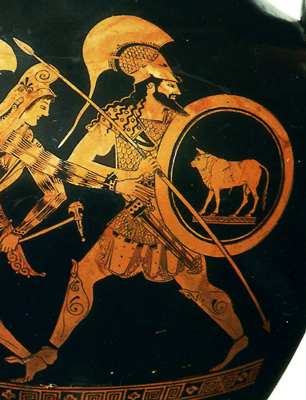 The ancient Greeks gave the world many wonderful gifts. They also spent much of their time warring with each other, as well as with foreign invaders, most famously the Persians. 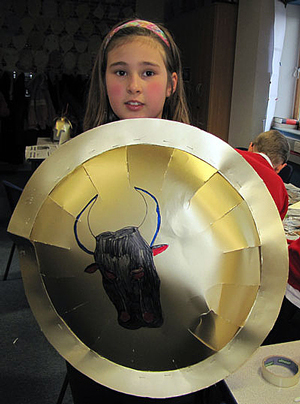 Children will learn about hoplites - Greek warriors from the 7th to 5th century BC - who fought in bronze helmets, cuirasses and greaves, with round, curved wooden shields decorated in bronze and painted pictures, and with long spears. 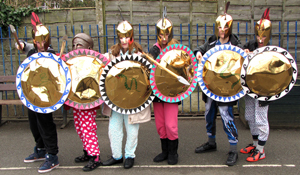 They will make their own helmets and shields, and try out the Greek battle formation - the phalanx, with overlapping shields. 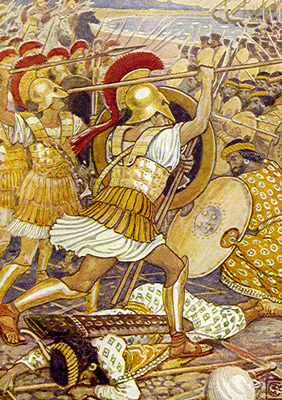 The afternoon session covers the famous battle of Marathon, in which only 10,000 Athenians stood against a far greater Persian force attempting to conquer Greece. 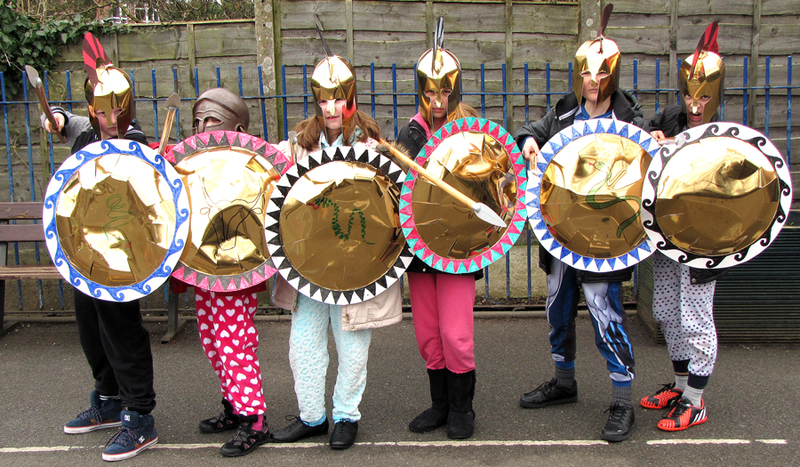 Children will learn about history through vivid experience - debating whether to fight the Persians, and going outside to march against the Persians in teams. Look at photo showing phalanx, from the movie '300'. 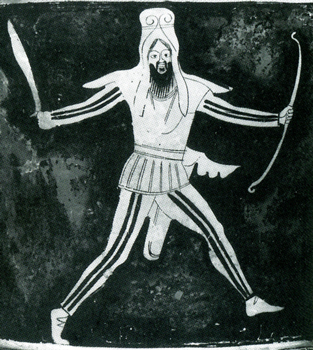 Look at photos of pottery paintings and statues depicting hoplites, plus large painting on a board. Try to spot all their gear, learn the names of each item and how they were designed and used. 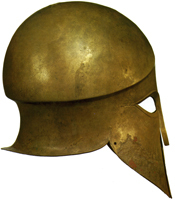 Focus especially on the shield with its round bowl-like shape with painted decorations, and the bronze helmet, with its coloured horsehair crest. Look at photos of real weapons and armour in museums and try to identify. 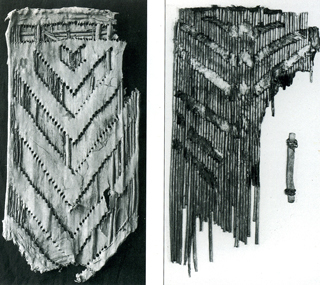 Learn what materials were used (e.g. bronze, wood). 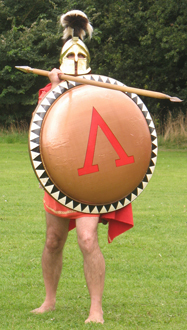 I will also show some pictures of hoplite reenactors. 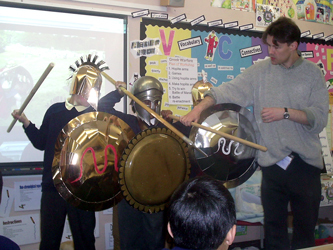 One child tries out my helmet, shield and spear and I teach them how a hoplite fought: the grip, stance, and movement. Then three children form the front rank of a phalanx, with shields overlapped and spears over the top aimed at the enemy. 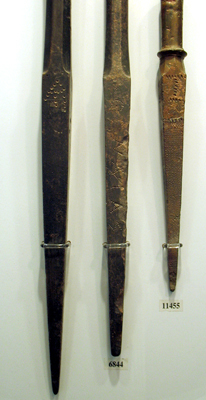 We then see how files were formed with men behind each other, spears reaching over their shoulders (see photo above). Finally we have nine children form a mini-phalanx with three ranks and three files. We try a thrust at the enemy and learn how difficult it would be to maintain a tight formation. 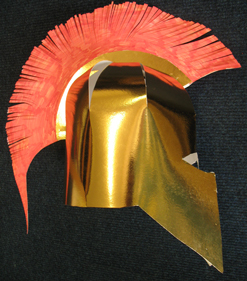 At 10.15 we will have a 15 minute break so I can set out the materials to make the helmets and shields. I will need 4 children to help me. Lesson plan continues in next column. 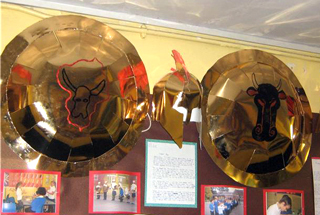 Children will make copies of helmets and shields. They will be divided into groups of four, and each group will make one set (each item requires at least 2 children). 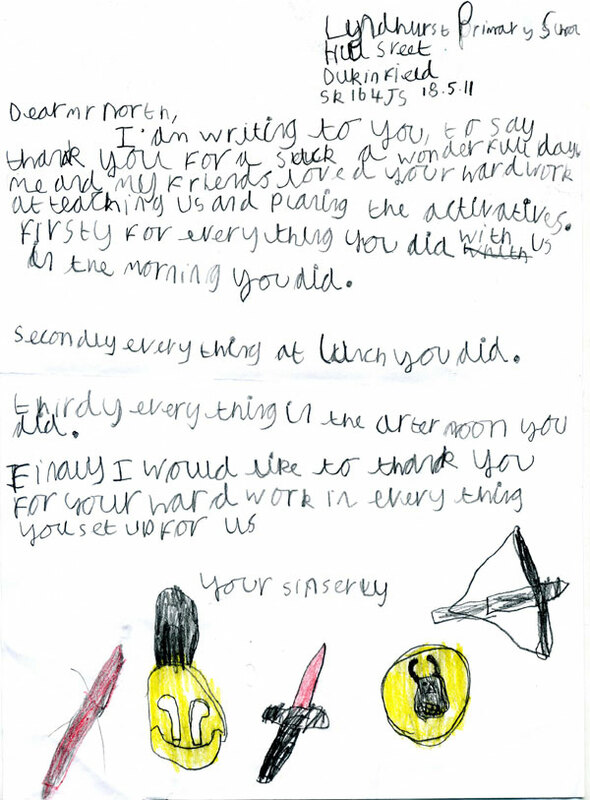 This activity is complicated and challenging, so extra support will be needed, especially with lower ability children. Shiny bronze and thick white card will be used, and templates for drawing round and cutting out, followed by sticking with glue, tape, and staples. 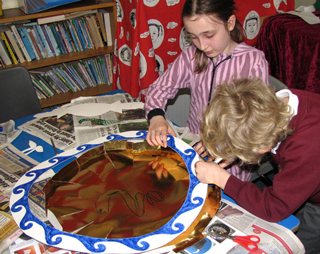 Shield makers will draw designs in the middle of their shields with permanent markers. They can also choose a wave or triangle design for the rims. Helmet makers can use a pencil to 'engrave' decorations around the eyes and nose, and choose from three crest colours (red white and black); they can also add stripes to the crests if they wish. 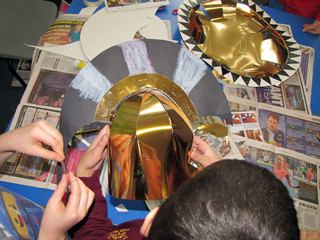 The helmet and shield making takes a long time so we will finish after lunch (and if necessary through lunch break). The end result however is extremely impressive and makes a wonderful wall display. 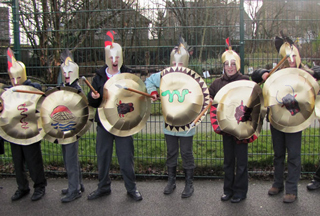 Moreover, the helmets and shields can be worn and used in our battle reenactment (or in your own drama activities). Background to the Battle of Marathon, 490BC. 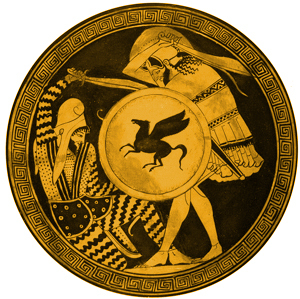 This was the first battle of the wars between Greece and Persia. 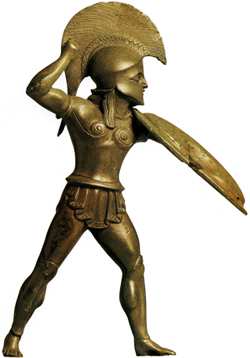 Despite overwhelming odds the Athenian army won a stunning victory. 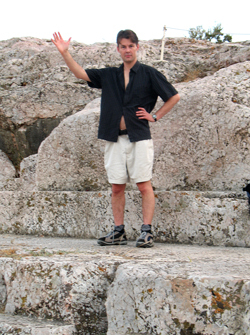 The runner Philippides was sent 146 miles to Sparta to ask for help - which did not come in time. We will look at maps showing the Greek city states and the vast Persian Empire, and discuss the threat of Persia. 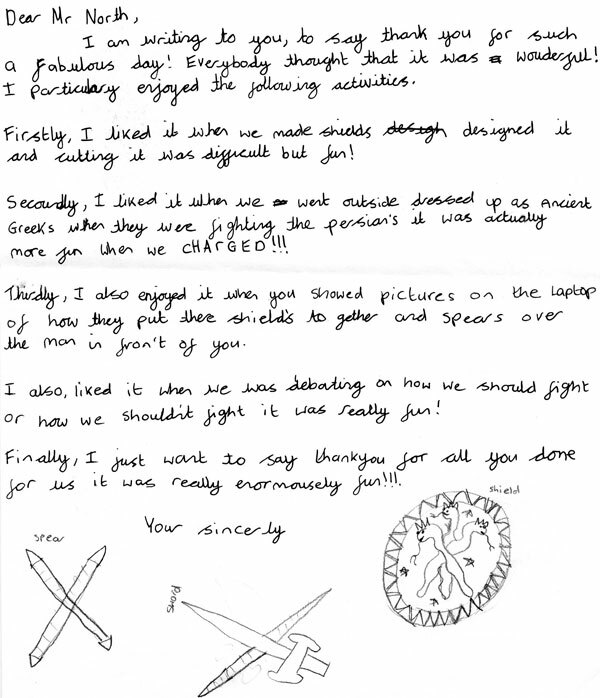 Children will see evidence of the weapons and armour of the Persian army, and imagine how an Athenian at the time would have felt facing such a large and successful invading army. After learning about the background to the battle and what was at stake, children will debate whether or not to fight the Persians. 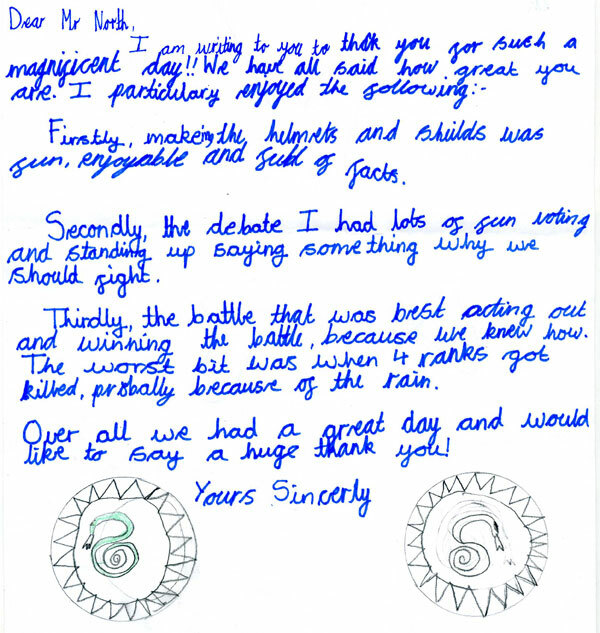 As well as reenacting the democratic debate which took place in 490BC, this activity helps develop skills of persuasive speaking and gives an experiential sense of the historical situation. Children must weigh the various pros and cons of fighting. 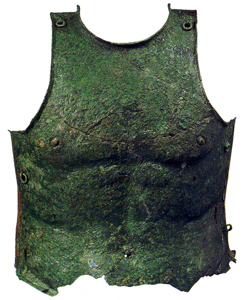 Pros include the superior armour and fitness of the Greeks, the desire to preserve freedom and honour, and the belief that the gods would support them. Cons include the far greater size of the Persian army and its previous successes, as well as their possession of a long range weapon - the bow. 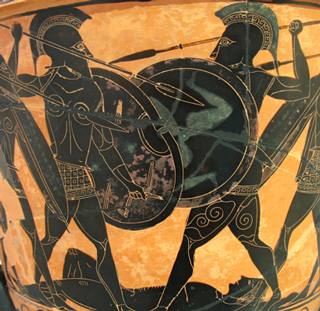 - running to avoid arrows and forming phalanx at the battle line. The children in the other 3 teams pretend to be the Persians, firing arrows. 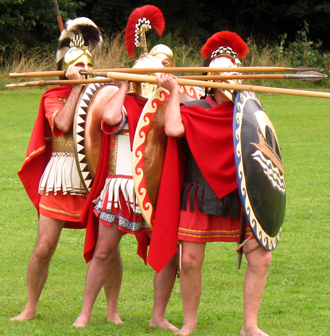 If time allows we will try the reenactment again, this time with the 'Persians' throwing soft plastic balls at the Greeks, to represent the arrows. Although the balls are harmless, children may find them distracting. Their job is to ignore the 'arrows' and form phalanx regardless of this attack. 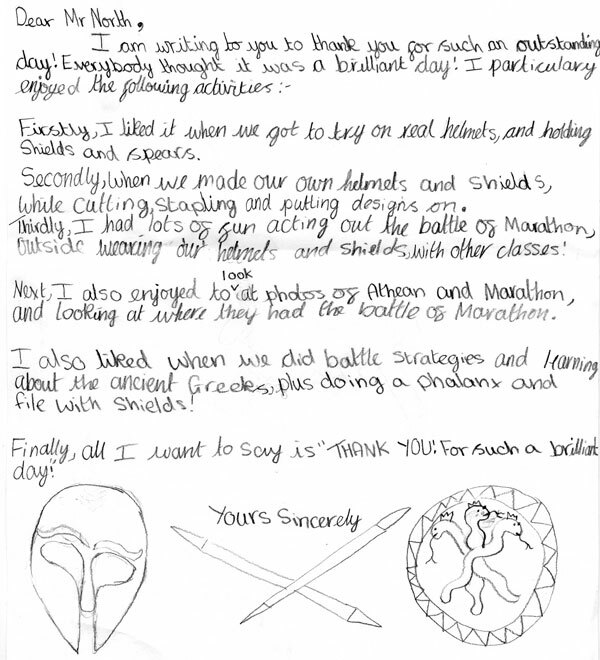 This experience will give the children a much better sense of the difficulty of maintaining order and self discipline under battle conditions. After this we will return to class and discuss what we have learned from the experience. 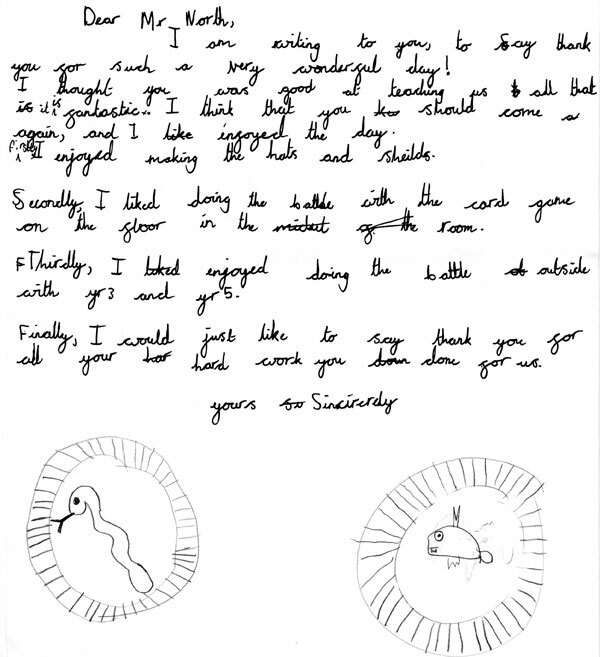 'Just a quick email to say thank you so much for today. Myself and my class absolutely loved the experience and it's one they'll never forget I'm sure! I am looking forward to doing a follow up piece of writing all about the Battle of Marathon and I'm quite sure they have lots of opinions on it now!